The Blogging Friends are very excited for this month’s blog hop, as we’re sharing with you projects we’ve created using new products from our new Stampin’ Up! Annual catalogue! Who are the blogging friends, you ask? Well, we’re a group of demonstrators who have gotten to know each other ‘virtually’ – through our blogs, and the exclusive demonstrator only website that we share. Some of us have been lucky enough to meet in person; but even being ‘virtual’ friends hasn’t stopped us from sharing our love of stamping and creating! Each month we choose a theme, and share with you our special projects. Since this is June, the release of our new catalogue, of course we want to share new products with you! To enjoy the blog hop is very simple; just click on the ‘Continue’ button at the bottom of the post, and you’ll be taken directly to the next blog in line. If the technical gremlins get in the way, there is a list of all participating blogs at the very bottom of the post. Enough chatter – let’s get on with the fun! You’ll have arrived here from the talented Danica Ferrante‘s post; weren’t here projects fabulous! This card involved a lot of stamping on smaller pieces of Whisper White cardstock, colouring, and then hand cutting, but I really enjoyed putting it together. I started by doing a light watercolour wash on the background using the new Dapper Denim ink and an Aqua Painter. I then stamped the bench swing in Soft Suede ink, and coloured it in using a Blender Pen and the Soft Suede ink pad. To colour the bench cushion, I used my Pear Pizzazz and Blushing Bride Stampin’ Write Markers. The separate cushions on the bench were stamped on scrap Whisper White in Memento Black ink, then coloured in using a combination of the Markers and Blender Pens in Blushing Bride, Flirty Flamingo, Emerald Envy and Pear Pizzazz. The flowers and pot were stamped in Smoky Slate ink, and again coloured in using Markers. 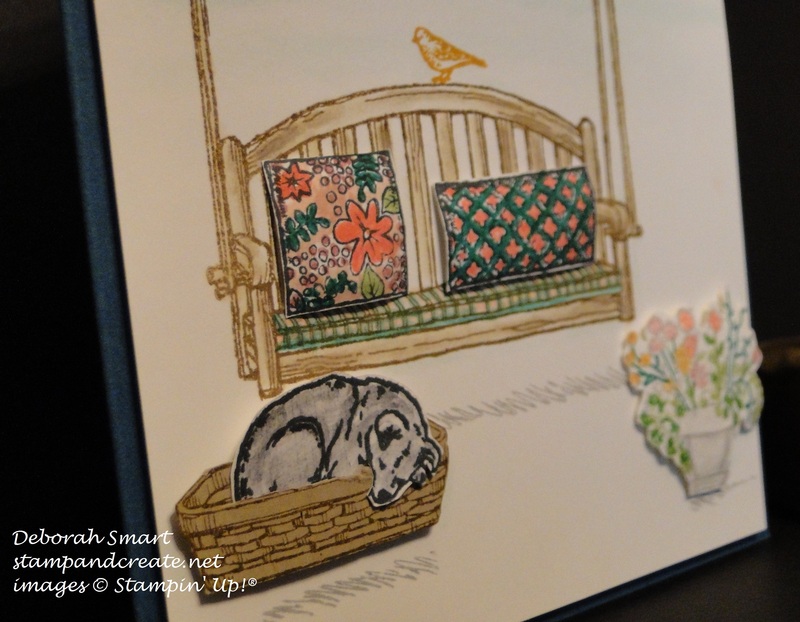 The dog bed was stamped in Soft Suede ink onto Crumb Cake cardstock, and the dog was stamped in Memento Black ink, and coloured using a Blender Pen and Black ink (because we have a Black Labrador Retriever ). 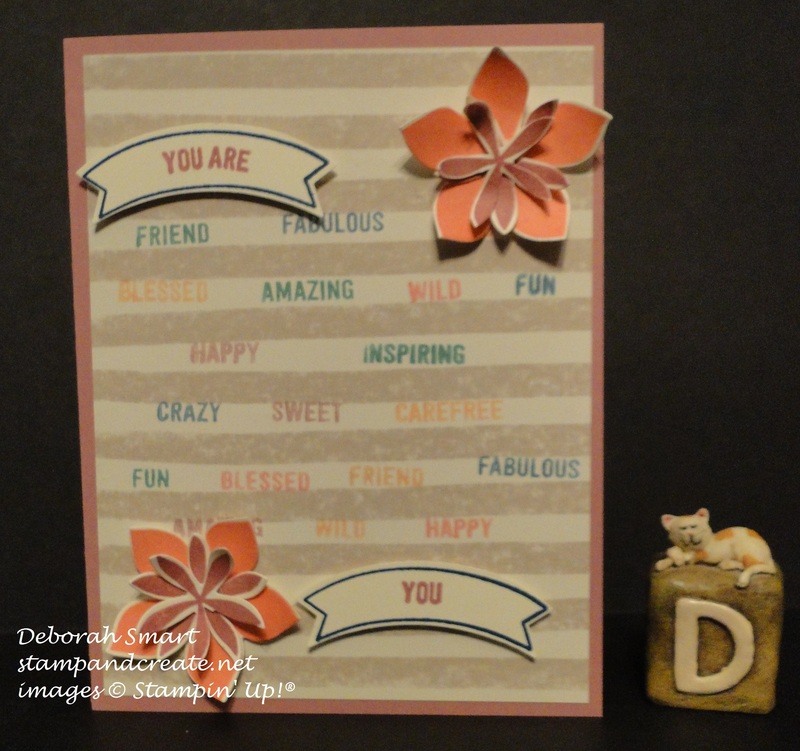 To create the 3D illusion with the hand cut pieces, I used my stylus on the back of the pieces to create dimension, then attached them to the stamped panel using Stampin’ Dimensional. After I completed putting the card together, I attached it to a card base of Dapper Denim cardstock. The Thoughtful Banners stamp set has a whopping 53 stamps; 46 of them are words, with 4 shapes and 3 different banners. So I had to find a way to show off some of the words that are in this set! I used a piece of retired DSP, and lined up the words on my clear block. I then used different colours of our Stampin’ Write Markers to colour the words, then stamped directly onto the DSP. The colours I used were the new Dapper Denim, Emerald Envy, Sweet Sugarplum and Peekaboo Peach. I stamped the banner outlines in Dapper Denim, then stamped the words inside the shape in Sweet Sugarplum ink, and used the new Duet Banner Punch for punching them out. To create the flowers, I used the Flower Patch stamp set, Peekaboo Peach and Sweet Sugarplum inks, and then die cut them with the Big Shot and coordinating Flower Fair Framelits Dies. No fussy cutting at all! 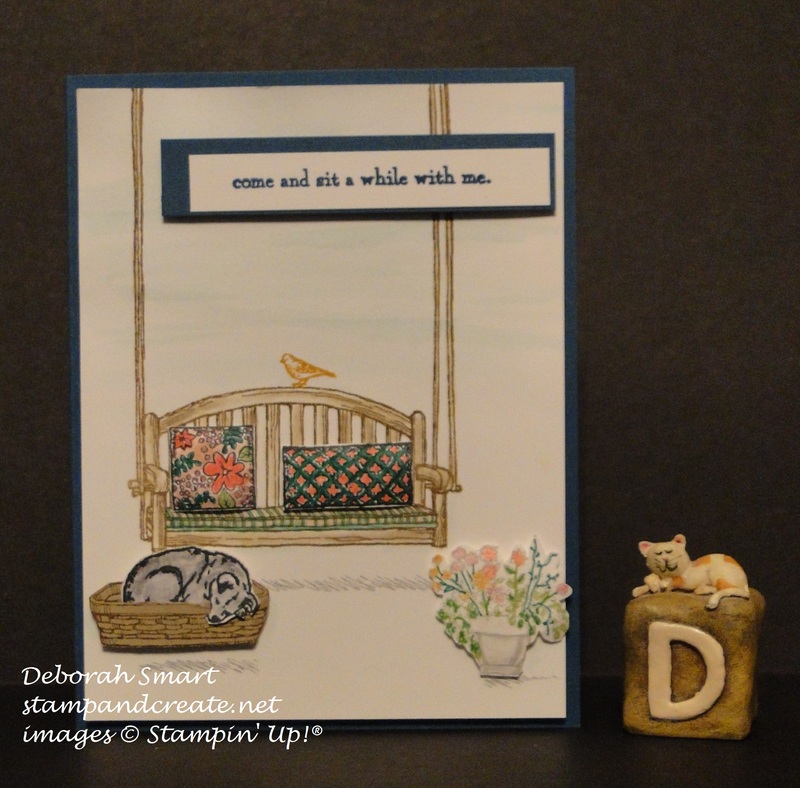 🙂 After I finished my stamping, punching and die cutting, I attached everything to the stamped panel using Stampin’ Dimensionals, and then attached it to the Sweet Sugarplum card base. Isn’t this fun?! I just love this bright colour combination of Flirty Flamingo (medium swirl), Peekaboo Peach (smallest swirl) and Calypso Coral (largest swirl). On my Whisper White cardstock, I started by stamping a large solid flower image from the Flower Patch stamp set in Calypso Coral. I then stamped the dots from the Painter’s Palette stamp set in Peekaboo Peach and Flirty Flamingo, then attached the die cut swirls, from the Swirly Scribbles Thinlits, using Glue Dots. I die cut the leaves from Pear Pizzazz cardstock, using the Flower Fair Framelits, and used my Old Olive Stampin’ Write Marker to draw on some leaf veins, and sponge the edges. I then added the leaves and a few of the Metallic Sequins to the card front. To finish off, I stamped the banner outline and sentiment in Peekaboo Peach using the Thoughtful Banners stamp set, and used the Duet Banner Punch for punching it out. 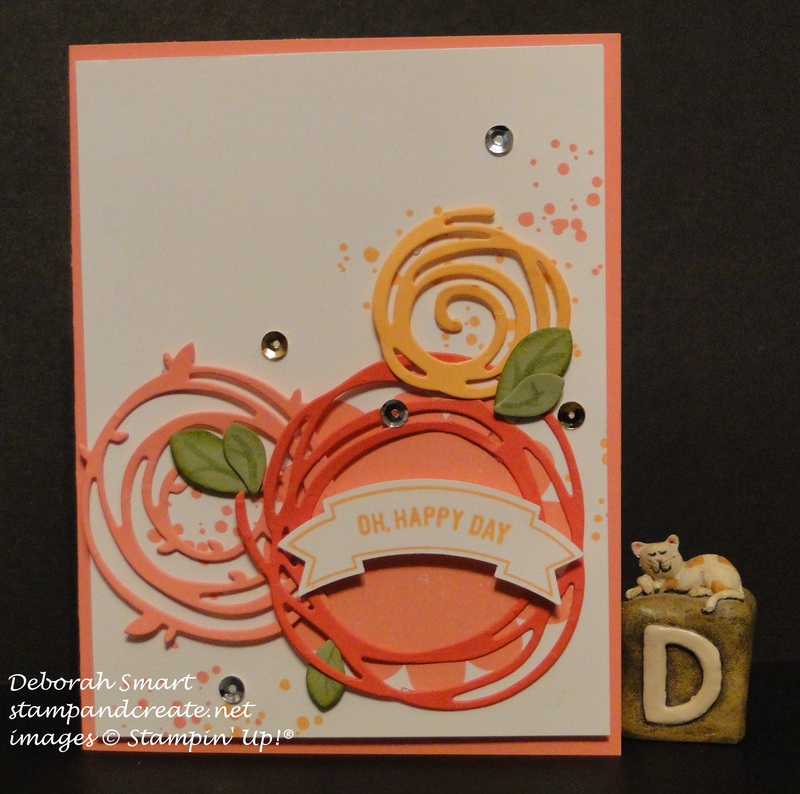 I popped it on top of the biggest swirl using Stampin’ Dimensionals, and then attached the front panel to my card base of Flirty Flamingo cardstock. Well, that’s it for my projects – I hope you enjoyed seeing them, as much as I enjoyed creating them! If you have time, I would love to read any comment you’d care to leave, to let me know what you think of my projects, as well as the new products and colours. Now, you’ll want to click on the ‘Continue’ button below, so that you can head over to see what wonderful projects that Jodi Horsely has created for you! Deborah Smart You Are Here! Next Next post: Where Does the Time Go?! Love the swing, sadly it didn’t make the cut on my list this morning to many other things I had to have first. My wish list is a long one, too, Rick! But I just had to have this lovely swing 🙂 Thanks for visiting! I love all of your cards this month! So many lovely things in the new catalog! I love your swing card. This makes me want to get that set. Great variety of cards showing lots of products! I love them because they’re all different!